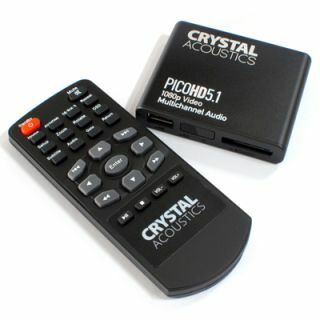 Crystal Acoustics unveils £50 PicoHD5.1 portable media player | What Hi-Fi? This tiny device from Crystal Acoustics is a portable media player that turns any USB memory stick or NAS drive into an entertainment source for your high-definition TV. Measuring just 7.5 x 6.5 x 1.5cm, and weighing 60g, the PicoHD5.1 delivers HD video up to 1080p via its HDMI output, and supports 5.1 multichannel audio. The device works with USB drives as well as SD, SDHC and MMC media cards, transferring music and video files held on them directly to your TV. There's support for DiVx, WMV, FLAC, .MKV, MP3, JPEG and BMP file formats, and the USB hub will work with FAT, FAT32 and NTFS external hard drives. There's also a 5.1 audio output for transferring surround sound to your home cinema amp.